Intellitec.s Isolator Relays are specifically designed to be used to isolate two battery systems. In this application, these relays are required to operate with almost no voltage across their contacts and carry currents ranging from milliamps to hundreds of amps. These relays have been designed and are built to meet these demanding conditions. The 100 amp Isolator Relay is designed for most common gasoline engines, while the 200 amp Isolator Relay is designed for heavier duty applications. The Isolator Relay provides a simple, reliable, and cost effective means of isolating two battery systems. It is installed between the two batteries, connecting them together for charging. The 100 amp unit can be switched manually through a dash-mounted switch or coupled with one of Intellitec's Isolator controls for fully automatic functioning. The 200 amp version is not a continuous duty unit and requires an Intellitec Isolator - diesel controller to prevent it from overheating when it is used for continuous duty. A momentary, dash-mounted switch can also be added to provide a "jump start" for the engine, from the auxiliary battery. In a battery charging situation, both batteries may be fully charged and at equal voltages. At that time, there is no voltage across the contacts. The relay's contacts must close and provide a low resistance without the benefit of any arcing for cleaning. To be sure these relays can perform under these harsh conditions, the contacts are protected with a unique antioxidant coating. In a jump start environment, the relay may have to deliver the full starting current of the engine. These relays, with their heavy construction, can easily deliver the needed current. The Isolator Relays are ignition protected, so they can safely be mounted in a convenient place near the battery. They can be mounted in any orientation and are immune to harsh shake and vibration found in the vehicle environment. Intellitec’s new 200Amp Battery Disconnect relay operates on the same principles as Intellitec’s 100Amp version that has been used by the industry for over ten years. These relays are covered by Patent No. 4,628,289. It is intended to be used in larger vehicles where the continuous current draw can be larger than 100 Amps. 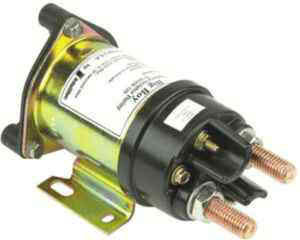 This relay can also handle heavy starter currents of large diesel engines.